Qualcomm announced its first LTE Advanced Pro modem, the X16 LTE, last February, supporting downlink speeds of up to 1.0 Gbps. Today the company announced its second-generation gigabit class LTE modem, the Snapdragon X20 LTE, along with some new RF front-end components. The Snapdragon X20 LTE modem will use Samsung’s latest 10nm LPE process and offer a few key enhancements over the X16 LTE modem integrated into the Snapdragon 835 SoC. 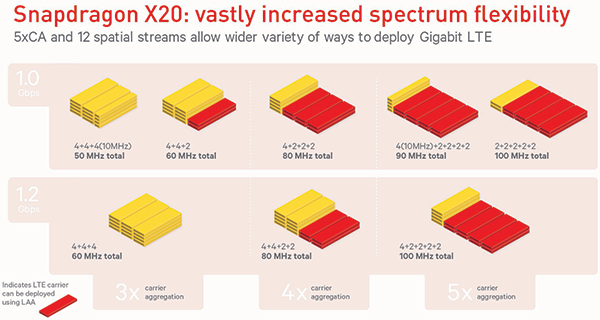 First, the X20 gains support for 5x carrier aggregation (5x20MHz), allowing for more flexible use of available licensed and unlicensed spectrum with over 1000 possible carrier aggregation band combinations. It also increases the number of usable spatial streams from 10 to 12 by performing 4x4 MIMO on three aggregated carriers. These improvements allow the X20 to support UE Category 18 on the downlink, boosting peak theoretical bandwidth to 1.2 Gbps, a 20% improvement over the X16 LTE modem. Uplink bandwidth remains the same, however, supporting up to 150 Mbps with 2x20MHz carrier aggregation and 64-QAM. Improving performance was not Qualcomm’s primary goal for X20, though; by supporting 5x carrier aggregation (CA) and Licensed Assisted Access (LAA), an LTE Advanced Pro feature that allows CA of licensed and unlicensed spectrum (5 GHz) on the downlink, the X20 allows network operators to deploy gigabit LTE service with only 10MHz of licensed spectrum. This is vitally important in many crowded markets where 20MHz blocks are rare. According to a Strategy Analytics study, 64% of network operators around the globe can deploy gigabit LTE using 20MHz CA and LAA, the configuration offered by the Snapdragon X16 LTE modem. This number increases to 90% when using 10MHz CA and LAA, making gigabit LTE a viable bridge to 5G. The Snapdragon X20 and X16 LTE modems share several features, including LTE Broadcast and Ultra HD Voice quality using the EVS codec. Both modems also support Citizens Broadband Radio Service (CBRS) in the US, a 150MHz slice of shared spectrum in the 3.5GHz band that can be used by operators for gigabit LTE service or even private LTE networks for industrial or large-campus applications. One new feature exclusive to the X20 is Dual SIM Dual VoLTE (DSDV), a technology that will help carriers transition away from legacy GSM networks. With DSDV the second SIM is no longer limited to 2G or 3G voice duties, because voice can be carried over LTE. It also allows the user to select either SIM for LTE data service. Like previous Qualcomm LTE modems, the Snapdragon X20 will be offered as a stand-alone product initially, but will likely be integrated into a high-end Snapdragon SoC next year. Qualcomm has begun sampling the new modem to customers and expects the first commercial devices to appear in the first half of 2018. Qualcomm also added several new products to its RF360 portfolio, including several new power amplifier modules and its next-generation TruSignal solution. The new components promise to reduce power consumption and improve signal quality, leading to better battery life and more consistent cellular performance under a broad range of conditions. They also adhere to Qualcomm’s philosophy of creating highly integrated RFFE components that reduce part count and simplify RF design for OEMs. The four new multimode, multiband power amplifier (MMPA) modules—QPA5460, QPA5461, QPA4360, QPA4361—are the first from Qualcomm to use GaAs as opposed to CMOS, which brings certain advantages when working with higher frequencies. The primary difference between the QPA54xx parts and the QPA43xx parts is that the former uses envelope-tracking when paired with a QET4100 envelope tracker IC and provides better power efficiency for LTE TDD networks, while the latter is optimized for average power tracking. All four MMPA modules combine switches with low, mid, and high band power amplifiers into a tightly integrated package. Qualcomm also released the D5328 Integrated Front-End Module (FEMiD) and D5285 Diversity Receive Module (DRX), both of which increase RFFE integration. The D5328 FEMiD combines layer-transfer switches, certain filters, duplexers, and a quadplexer into a single module, while the D5285 DRX is a similar part for the diversity receive path. 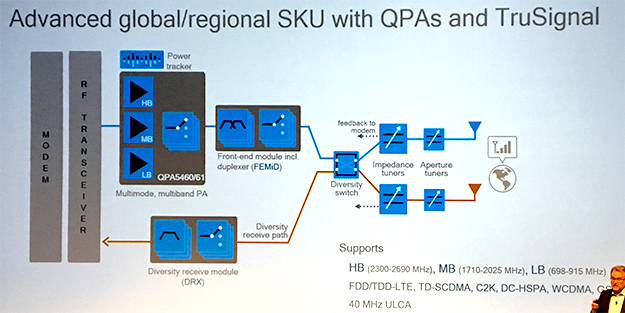 Qualcomm’s latest TruSignal adaptive antenna tuning solution, which combines the QAT3550 impedance tuner, QAT3514 aperture tuner, and QAT3522 antenna diversity switch, is the first to support carrier aggregation. The components work together with the modem, which provides advanced signal processing, in a closed-loop system to ensure optimal signal quality. 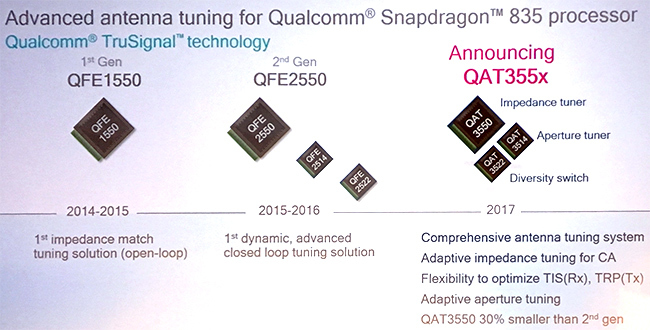 The third-generation QAT3550 is 30% smaller than the second-generation QFE2550 impedance tuner, and all three QAT35xx parts can be used in conjunction with the Snapdragon 835 SoC. Was more or less my feeling when browsing suddenly happen quickly on my phone when I was in range of a newly upgraded base station. I was a bit puzzled and then I noticed the little "H" by the signal bars had become "LTE".